This 1980's era bath was ready for a refresh. The tub featured that 1970's golden fiberglass, complimented by light blue flowers in the vinyl floor and a well worn vanity. 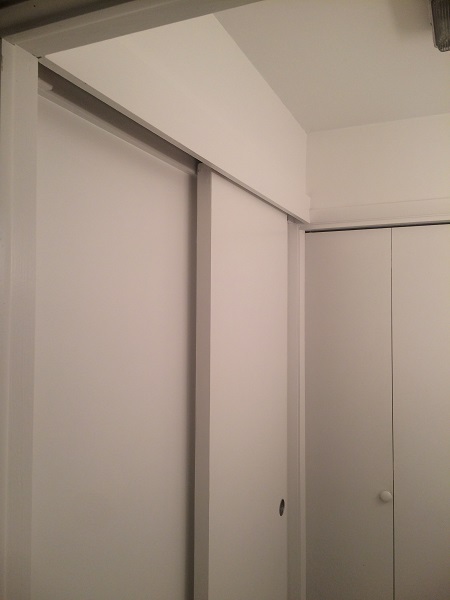 There was also an interesting sliding door for the main entrance, and a linen closet tucked into the end with a bi-fold door that obstructed the entry when open. 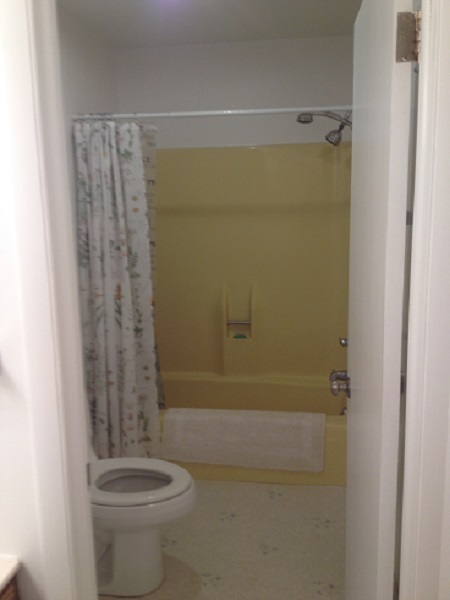 To improve the flow of the bath, we removed the closet wall and replaced it with a linen cabinet. 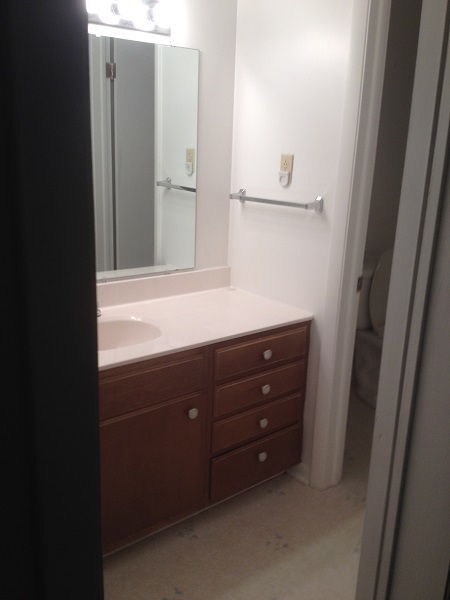 The cabinets in the vanity assembly are ready-to-assemble cabinets supplied by Custom Service Hardware. (www.cshardware.com) If your impression of read-to-assemble cabinets is only cheap particle board with a thin melamine skin, you're missing out on a lot of value. These cabinets are the Galaxy Frost series, and feature plywood boxes, hardwood face frames, and solid wood dovetailed drawer boxes. The finish on the cabinets is excellent. The Blum soft close hinges and undermount drawer slides are a premium feature. I added tilt-out hardware to the false drawer front in front of the sink, offering some extra storage. If you're planning to remodel a kitchen, a quality ready-to-assemble (RTA) cabinet offers features comparable to, or exceeding a semi-custom cabinet, often in less time and for a lower price. The new remodel features an extra deep acrylic soaking tub by Jacuzzi. Standard tub/shower combos provide approximately 12 inches of soaking depth when the tub is filled. The rim on an a deep soaking tub is about 4 inches taller, allowing the user to more easily be fully submerged. 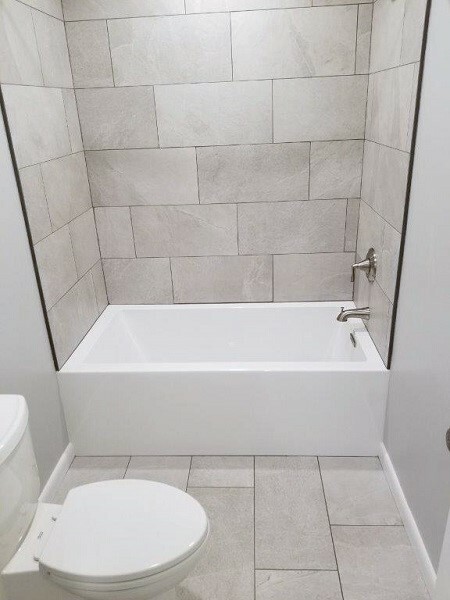 The large format tile with 1/8" grout lines provided a sleek modern look that complimented the simple white shaker cabinet trim. The carrara marble vanity top complements the veining in the tile. The honed finish (matte finish, not a glossy polished finish) minimizes water marks. Premier Stone in Salem, VA did a great job fabricating and installing. They're also a pleasure to work with.